Calgary is home to several lake communities. Those communities are loved by many families. Spending your weekends at a lake with the children, swimming, fishing and being involved in other activities is very attractive. At some of the lakes there are winter activities like ice fishing and hockey. Very often the home owner association fees (HOA) are very low, making living in a lake community even more attractive. 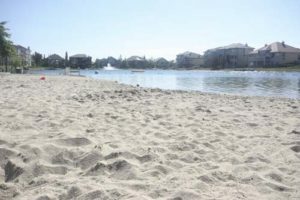 Bonavista Lake was the first community in Calgary with a (man-made) lake that was developed in 1967. The community of Sundance offers Lake Sundance, a 33 acre lake. Midnapore Lake was excavated in 1976. Then there is McKenzie Lake, developed in the early 80’s. The 32 acres of lake in Lake Chaparralwas established in 1995. Mahogany Lake is the largest fresh water lake in Calgary, with 63 acres. In the Northwest you will find Arbour Lake developed in 1991. Coral Springs, with its lake, can be found in the Northeast. Please be aware that buying a home in a lake community does not necessarily give you access to the lake. Some communities require that you live within a certain distance of the lake. Please check with the community associations before buying!